Okay I got to play tourist today. 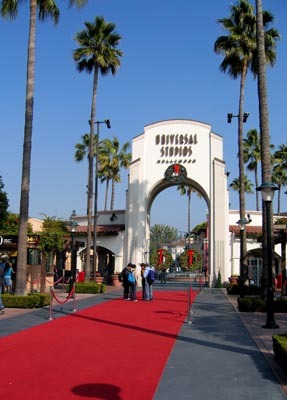 Besides tooling around Los Angeles shopping I also headed over the Universal Studios. This is actually a great time to go here since it’s not hot and there are no crowds. You pretty much have run of the place, short lines for all the shows and rides. Yeah, I did go on the Mummy Returns ride which is new there. What did I think? It’s a rather short ride on a roller-coaster that is in pitch-black for about 80% of the ride which is supposed to add to the scariness. But I think it would be more scary to actually see stuff around you as you whiz by on the ride knowing that some insubstantial rail or bolts are all that stand between you and death. But I digress, it’s a pretty good ride that’s inside of one of the big sound studios, lots of screaming going on. Here’s a panoramic view of the Waterworld set at Universal Studios, click on the image for a larger view. 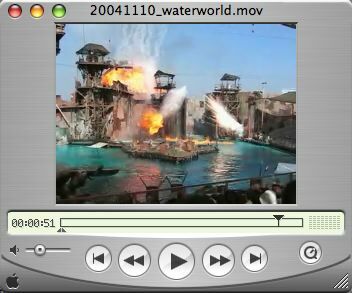 Had to check-out the Waterworld show. I actually saw them film Waterworld (the movie) on sets near Kawaihae Harbor. I shot huge explosions, airplanes, helicopters, boats, jet-skis all that stuff during the filming (okay I wasn’t on set but I was on shore with a telephoto). I also shot photos of the atoll they used in the movie as it was in pieces after production was done (even walked up and touch the stuff, the metal armor on the atoll seemed to actually be fiberglass). My photos appeared in Vanity Fair magazine when they did a huge spread on Waterworld. Even got to party with the Waterworld crew every weekend at Big Island Steakhouse in Waikoloa during the filming. The place was dead after filming ended. Click on the above image for some video clips I shot during the show (about 3MB in size so broadband or patient users only). Overall a great show and much more entertaining than the actual movie. Ah yes, and the drive back to Laguna Beach. Is there ever a time when there isn’t traffic in Los Angeles? I mean, I drove there morning noon and night and a few times in between and there was always bumper to bumper traffic on the freeways. 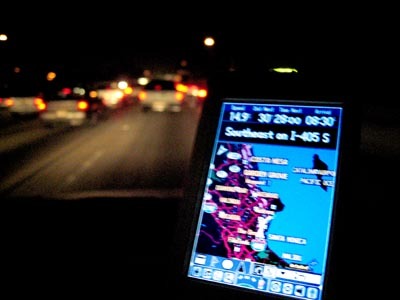 While on the mainland I used my Garmin iQue 3600 to guide me around town. All I needed to do was plug-in the street address of my destination and it would tell me the route to take, an actual synthesized voice told me when to get on/off the freeway or when the turn on a roadway. This darn thing was amazing, it could take me right to the doorstep and even tell me what side of the road to look for my destination. Can’t get lost with this thing.